"In most reports, a small group of kids with all-black eyes approaches an adult who's alone in a car or a house. The kids, usually two boys between the ages of 10 and 13, ask for a ride home or to be let in to the house to use the bathroom or telephone. The adult feels a sense of overwhelming fear before realizing that there's something drastically wrong with the children's eyes." 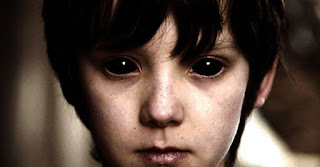 • Fear: Black eyed children are just plain wrong.